Profoundly knowing, accepting and loving yourself through full self-knowledge. In theory all days are optional however in practice newcomers are directed to attend the opening days in sequence to increase their understanding and awareness in the most optimal and comfortable way. Each day will be filled with fresh insights and experiences. Those fortunate to attend all 7 days will receive enjoy a full, over sense of self and existence and well-balanced integration of all received revelations. You will expand, you will be stretched and you will receive the pleasing after-burn of time very well spent and benefits for eternity. Spiritual seekers with prior experience of the Enlightenment Transmission can take advantage of a rare opportunity to spend 2 wonderful days on a profound spiritual journey to wholly know their soul in this human incarnation. Each 6-hour day will be packed with practical energy clearing techniques, deep spontaneous meditative states, phenomenal amounts of awareness-raising Enlightenment Transmission and questions and answers. Every day will be unique and customized to the needs of the group on the day. The Enlightenment Transmission ensures that everyone receives special gifts. Spiritual seekers who have already met Enlightened spiritual teacher Dave Oshana are eligible for the Intensive. But you need to book early because space is limited. These Enlightenment Transmission Intensives are popular because you can get completely off your face with happiness for the rest of the year! If you have previously attended an Enlightenment Transmission Intensive, you do not need to prepare for this Intensive. 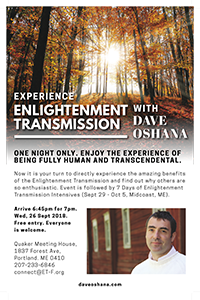 But for your own benefit, to access higher states when encountering the Enlightenment Transmission, it is highly recommended that you bring yourself up-to-date with the Transmission by meeting Dave at an Introduction event or by having a face-to-face One-to-One with him. If it is not possible to meet Dave in person then a Zoom/Skype One-to-One is sufficient. If neither of those options is possible then attending live online classes is also good preparation. And if there are no live classes then you can listen to class replays or downloads. 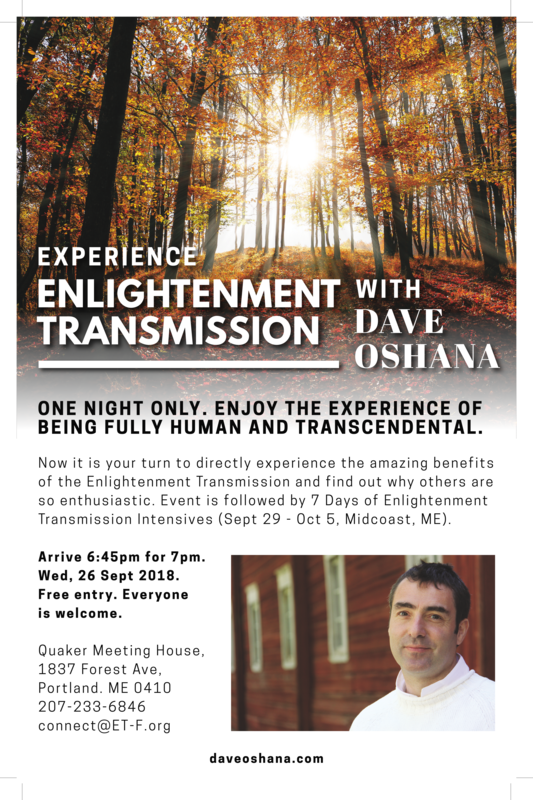 If you have never attended an Enlightenment Transmission Intensive then you do need to meet Dave before attending. If you cannot, then it may be possible to prepare by an alternative route but you should contact us by email as soon as possible. Ideally you would meet Dave personally at an Introduction event. In this way you can familiarize yourself with Dave, his teaching style and concepts, the effects and benefits of the Enlightenment Transmission and the group teaching environment. If you cannot attend an Introduction event then you can prepare by completing the EPSAF form and booking a Zoom/Skype One-to-One with Dave. Alternatively you can complete the EPSAF form and attend either live online classes or listen to class replays. The EPSAF form should be requested by email ASAP if you choose this preparation route. Request an EPSAF form by email.